Have just acquired a Roland Integra 7. I understand the restriction of each extension pack being loaded into ram slots - however this can all be arranged with custom Studio Sets. However - with recall of sounds being important within this (for studio work) - I need to be clear how to target specific sounds, within the selection available within ram, by including programme changes in Logic tracks. The default system in Logic does not seem incorporate both LSB & MSB - both required for the vast array of sounds in the Integra. I believe that I must use a “custom” programme change approach - but this is bewildering me. Any Integra / Logic users who can simply explain the process - and understanding the Integra-7 - be familiar with its unique architecture. However, for a long time (since Logic 1.x basically) there are limitations on how many banks a multi-instrument can support, and these instruments have a lot of banks, and they are often in non-contiguous blocks. I don't have an Integra, but an XV-5080 (the Integra is basically an XV-5080/Fantom with all the SRX cards installed, and should have the same bank format implementation.). Also, only MIDI tracks support bank/program changes from the inspector, audio or software instrument tracks do not, so if you are already using the Integra with the External instrument method, you won't have access to program changes (I find this annoying, and want to develop a solution for this at some point) unless you also use a separate MIDI track for this purpose. So it really depends on what you want/need to do. I can have a look at what I did for my XV-5080 (it's been a while) but I seem to recall I set up a bunch of multis with all the patch names across multiple banks, and some complicated environment hackery to combine them into one (ie a contiguous set of bank changes than got converted into the *actual* bank numbers to access the various patch banks), but this might be above the level you're willing to go. So, how are you using the Integra in Logic, and what do you want to do..? Hi Desmond, thanks for replying. Firstly I am presuming that unless an extension pack (all built into i7) is actually loaded into the ram slots (4 available) they are inaccessible. However, on the sound list provided - each unique sound or tone has a unique LSB, MSB, & prg # associated with it. I am presuming that any selection, once loaded into the ram slots, is accessible - but unsure whether to try the unique # combination, or something more appropriate to logic's restricted range. The preset choice of LSB & MSB #s found in the drop-down for custom messages does not include those implemented by Roland in the i7. Although I have read that a sequence of control #s might do the trick - as the fields available in an event are not comprehensive enough to stipulate MSB, LSB & prog #. TImellis wrote: Firstly I am presuming that unless an extension pack (all built into i7) is actually loaded into the ram slots (4 available) they are inaccessible. TImellis wrote: I am presuming that any selection, once loaded into the ram slots, is accessible - but unsure whether to try the unique # combination, or something more appropriate to logic's restricted range. The thing to do is do some tests to verify any behaviour you're not sure about. TImellis wrote: The preset choice of LSB & MSB #s found in the drop-down for custom messages does not include those implemented by Roland in the i7. I want as much recallability as possible. Although I plan to make audio tracks from each MIDI instance, while still at the ideas stage it is useful to have some degree of recall. I can achieve this in Integra by ensuring that the extension slots are appropriate to each saved studio set - but within these sets I want a) recall & b) freedom to discover alternatives. Sorry - what I mean is - how are you using it in Logic? How are you using Tracks to sequence it? - MIDI tracks? Instrument, or Multi-instrument object? or External Instrument plugin? Are you routing audio from the Integra back into Logic? How? External Instrument plugin? Audio inputs? Recording to audio tracks? I have set the Integra as a Multi instrument (MIDI) in the environment page. Addressing i7 through the Mac and AMT 8. I have the digital audio output of the i7 as a digital input on my DM24 and can send as a direct out to Logic to record audio, being synchronised & triggered by the previously recorded MIDI track. It is simply in accessing all available sounds via programme change commands of some sort. I realise that the relevant expansion modules must be installed on a per Studio Set basis - but it is possible to reconfigure which modules are loaded automatically at startup - so I figure I will eventually settle on a most used configuration. Nevertheless - even within this setup, I would want to access the complete variety of loaded sounds - addressed by MSB, LSB & prog # - and have this recallable by having it included in the song data for each midi channel/track in Logic. TImellis wrote: I have set the Integra as a Multi instrument (MIDI) in the environment page. Ok, cool. Just didn't want to configure a multi-instrument setup and then you say you were using the External Instrument, in which case it would all be wasted! TImellis wrote: It is simply in accessing all available sounds via programme change commands of some sort. 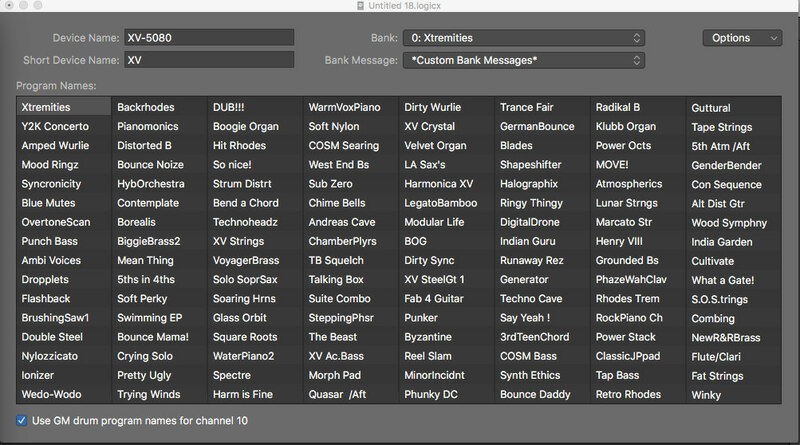 Ok, so, a multi-instrument can have up to 14 banks of names. However, although you can't have more names than that, you *can* access more than 14 banks. The bank indexes will be listed in the manual, give me a shout it you need help with them. In any case, that's an example of the bank select format which should work on the Integra as well. The complete Sound List has MSB ranging from 86 - 121, LSB from 64 - 101, and with each permutation of these, a programme # of 1 - 128. But no sound can be accessed unless the appropriate extension is loaded into a ram slot, when necessary. The programme change instructions from Logic can only address what is preloaded into ram, but as you can imagine - there is a mind boggling amount of unique #s going on here. TImellis wrote: The complete Sound List has MSB ranging from 86 - 121, LSB from 64 - 101, and with each permutation of these, a programme # of 1 - 128. Yes, so you set up whatever custom bank changes you need in whatever order works best for you. Obviously each bank has 128 patches in it. Now you have the format, you should see how to do this. TImellis wrote: But no sound can be accessed unless the appropriate extension is loaded into a ram slot, when necessary. Yes. Essentially, the way the Integra works I believe is that you have four SRX "slots" (like the XV-5080), but all the SRX "cards" inside. You choose which cards you (virtually) want to load into which slots (as if you choosing which real card to put into each of the four card slots on the XV). You can only access card/patch data from those active slots, cards not loaded into slots are effectively "not plugged in" and thus inaccessible. I assume they did this so they could keep the same architecture as the Fantom/XV, rather than improve the spec to allow all cards to be accessed directly. There is no way around this, as far as I know - but then I don't have an Integra, maybe there are ways to remotely choose a card mapping perhaps...? TImellis wrote: The programme change instructions from Logic can only address what is preloaded into ram, but as you can imagine - there is a mind boggling amount of unique #s going on here. Many thanks Desmond - that looks promising. Final query - do I still adhere to the LSB, MSB, PROG# - as listed in the sound list, despite the restriction of the virtual slots. Meaning that the listed numbers are appropriate to address the programmes - once loaded? Apart from the custom setup control #s - did you adjust each individual tone name to match those of the XV - or are these just generic names? That’s a heck of a lot of work. I might just leave that step - I will have the Integra right in front of me for any confirmation needed. I’ll give this a go when my smart head is on. Working in Sibelius right now - producing the music I will need the Integra for, eventually. TImellis wrote: Final query - do I still adhere to the LSB, MSB, PROG# - as listed in the sound list, despite the restriction of the virtual slots. I'm not sure of the behaviour without looking, as I said, you'll have to do some tests. If the banks per card have their own bank numbers (ie, the "Strings" card has eg Bank 91-97, the "Drums" card Bank 98-105 etc), then likely all it means is if you send a bank 91 message, and the Strings card isn't loaded into the machine, nothing will happen, the Integra would just ignore the message. TImellis wrote: Apart from the custom setup control #s - did you adjust each individual tone name to match those of the XV - or are these just generic names? TImellis wrote: That’s a heck of a lot of work. Nope, just get the names into a text editor from the PDF manual (or editor software) and just paste the names in. Pretty easy. TImellis wrote: I might just leave that step - I will have the Integra right in front of me for any confirmation needed. Just a quick update - I have sussed the bank/programme change challenge - many thanks for your help. I have decided to use track events in Logic for any changes necessary - and load the relevant extension cards when any particular Studio Set requires them. Also venturing into the other remarkable goodies available by control #s - also using the event system - rather than having to reprogramme the knobs & buttons on the A49 keyboard which I have also acquired (mainly because the piano I use has not got a modulation or pitch bend control). All in all - a staggering product - having only just scratched the surface - but of course, this means being faced with a staggering amount of choices to make, across all the variety of sounds. I’m still discovering things in Logic - like the ability to drag audio loops and clips (Garage Band & the like) into tracks - for momentary spice. I conclude that having such choice only satisfies the nagging, initial doubts I always seem to face when starting a large project - that such a vast variety is necessary. When really this is perhaps doubts in myself and my abilities - which reach out for tangible support. It is detailed, time consuming work - getting musically satisfactory results from machines. I’m not sure that a gargantuan range of choice actually helps. Anyhow - much appreciated your timely help - many thanks. And now . . . to work . . . Choice can be both a great thing and a bad thing, of course, but at least you can restrict choices according to your needs. And these days, we've never had it so good with what we can do!